Name of a family of Sephardim that flourished in Brazil, Germany, Holland, Hungary, and Italy. Thirteen persons bearing the name are buried in Altona, the earliest epitaph being dated 1620 and the latest 1782. A Jac[ob] de Dan[iel] Machorre was one of the contributors to an album which contained the autographs and verses of thousands of persons who had inspected Prof. D. Mill's model of the Temple of Solomon at Utrecht (c. 1748-57). Mention is made of a Maczoro, in Temesvar, Hungary, in 1772 Abraham, Moses, and Solomon Machorro flourished at Amsterdam about the middle of the seventeenth century. The first two were members of the society Temime Derek. Abraham is highly praised by De Barrios as one skilled equally in the use of the flute and of the pen. 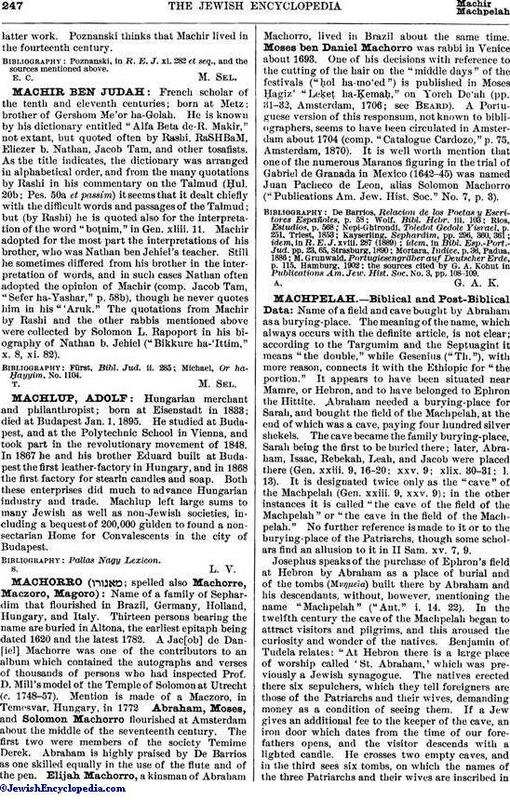 Elijah Machorro, a kinsman of Abrabam Machorro, lived in Brazil about the same time. Moses ben Daniel Machorro was rabbi in Venice about 1693. One of his decisions with reference to the cutting of the hair on the "middle days" of the festivals ("ḥol ha-mo'ed") is published in Moses Ḥagiz' "Leḳeṭ ha-Ḳemaḥ," on Yoreh De'ah (pp. 31-32, Amsterdam, 1706; see Beard). A Portuguese version of this responsum, not known to bibliographers, seems to have been circulated in Amsterdam about 1704 (comp. "Catalogue Cardozo," p. 75, Amsterdam, 1870). It is well worth mention that one of the numerous Maranos figuring in the trial of Gabriel de Granada in Mexico (1642-45) was named Juan Pacheco de Leon, alias Solomon Machorro ("Publications Am. Jew. Hist. Soc." No. 7, p. 3). the sources cited by G. A. Kohut in Publications Am. Jew. Hist. Soc. No. 3, pp. 108-109.